You are here: Home / Blogging through the Alphabet / What is Delight-Directed Learning? I’ve written before about my conviction to move our homeschool to a more delight-directed approach. But what exctly does that mean? Where do you begin? The above definition of the word, “delight,” is a good beginning to answering those questions. Don’t you just love the word, rapture? That’s just the beginning. I could probably go on, but I think you probably get the point. Ben and I had struggled with homeschooling off and on since we began when he was a preschooler. If we weren’t having fun, he was acting out. I blamed it on bad attitude, laziness, or hyperactivity on his part, or my own inability to find a curriculum that worked for his learning style. But then about 2 years ago, I had a revelation. And not a day to soon. It wasn’t about his attitude or activity level. It wasn’t even a character issue or my lack of meeting his learning style needs. It was boredom, plain and simple, boredom. It was like that philosophy class I had in college, that I had no interest in, but was required to take. Give me anatomy and I flourish. Give me philosophy and I fall asleep. Ben was falling asleep. He needed more anatomy! We’ve always enjoyed unit studies, when we’ve done them. And we have done them, off and on, for years. We started homeschooling with Five in a Row (FIAR) when Ben was 4. I’ve always praised the curriculum, encouraged people to try it, loaned out my manuals. As Ben got older, we moved on to Amanda Bennett’s unit studies. But we never used either as regularly as we should have. Why? Because I was always concerned about whether or not unit studies were enough. Or because, in the back of my head, I wondered what else I was missing. I was often swayed by beautiful catalogs, fancy websites, or passionate convention speakers, all touting the latest and greatest in homeschool curricula. Sometimes I even felt like if I didn’t try the latest and greatest, I was somehow failing my child. Never mind the fact that he loved unit studies and learned so much we when used them. In the end, because of my own insecurities, I was failing him. I was attempting to fill Ben’s bucket. I should have been lighting his fire. Sometimes I did get a spark, but before it could really burn bright, I snuffed it out, time and time again. In the end, instead of helping him find delight, enjoyment, JOY in his learning, I was leading him down the road toward boredom, dread, and frustration. But we’re on the right road now. I believe with all of my heart, that giving Ben the tools to learn about those things he is interested in, passionate about, and bring him joy and delight, will give him the tools to a lifelong love of learning. He’s already proved it over and over in the past year or two. Are you wondering how? Read on . . .
His love of animals, and desire to be a veterinarian, led us to the Kentucky Horse Park, which led us to a unit study on horses. His love of astronomy and desire to someday apply to the NASA program (as a vet, of course), led us to the US Space and Rocket Center, which led us to a unit study on space. His interest in the current elections process led us to a unit study on elections. Instead of choosing a science curriculum for him, I asked him what he wanted to learn more about–chemistry! When he asked to learn more about WWII airplanes, we visited the Patton Museum and found a great lapbook on that time period. A couple of winters ago, a unit study on the Winter Olympics, coupled with 10 inches of snow on the ground (God is so good!) led him to explore winter sports, the science behind them, and the people involved with them. He already loved snow, but learning more about it was such a bonus! And finally, when we were both so frustrated with math, we tried a more living book approach and now he doesn’t even mind it. He is having fun, learning, reading, exploring, asking questions, seeking answers, researching, and finding new and creative ways to spend his free time . . . all those things you hope your child will do. Never would I have seen these changes in him on our former path. Now we have goals that don’t include page numbers, boring lessons, planner check boxes, or completed textbook chapters. Ben will be entering middle school in the coming months. 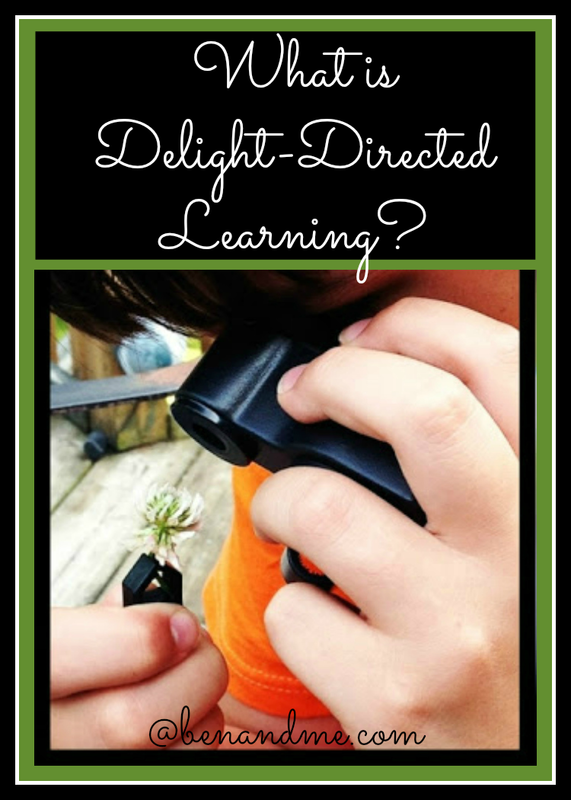 For some homeschools, that means the end to the delight-directed, unit study approach. But, not for us. Sure, the subject matter will become more intense, more varied, and the expectations I have for his research and writing abilities will greatly increase. But the destination will remain the same . . . delightful learning. I am looking forward to the journey. And more importantly, so is Ben.